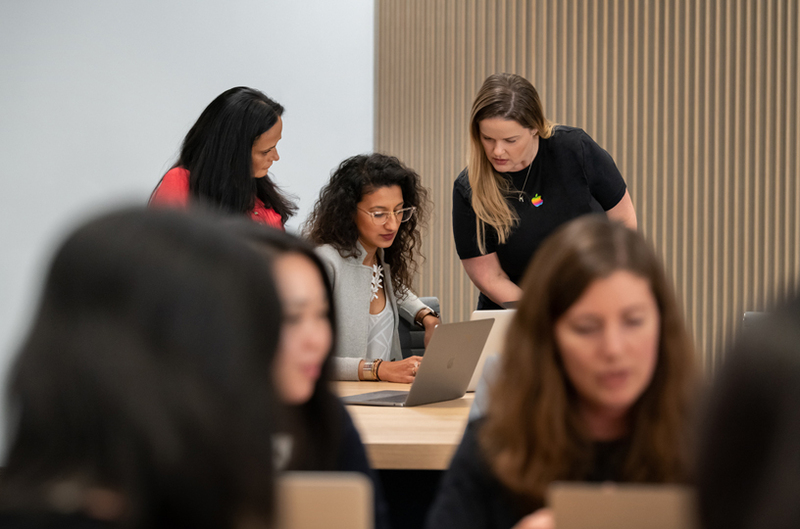 Apple launches app development program to support women entrepreneurs<br/>New Entrepreneur Camp Offers Immersive Technology Lab and More for Female App Developers who are Founders and Entrepreneurs<br/>Cupertino, California — Apple today announced the launch of the all-new Entrepreneur Camp, a first-of-its-kind initiative designed to create new opportunities for app-driven businesses owned or led by women through an intensive technology lab, specialized support and ongoing mentoring. <br/>Entrepreneur Camp will hold sessions on a quarterly basis, with a cohort of 20 app companies accepted for each round. The pilot session will include 10 companies. <br/>Once accepted, each company will have the opportunity to send three attendees to Cupertino, California for a two-week immersive program at Apple’s campus, including one-on-one code-level assistance with Apple engineers, sessions on design, technology and App Store marketing, as well as ongoing guidance and support from an Apple Developer representative. Each participating company will also receive two tickets to the following year’s WWDC. <br/>Female entrepreneurs continue to face challenges obtaining funding, training and support in the VC landscape — receiving $1.9 billion in funding in 2017 compared to $83.1 billion for men. Despite such obstacles, women-owned businesses are growing more than two times faster than the US national average, with women-led tech startups delivering a 35 percent higher return on investment than tech startups led by men. <br/>For more information on Apple Entrepreneur Camp or to apply, visit <a href="https://developer.apple.com/entrepreneur-camp/" target="_blank">developer.apple.com/entrepeneur-camp</a>.